Dear followers! As you know by now, a couple of weeks ago I was very lucky to once again receive a package of samples from the nice people at Clydesdale (Sweden stop importer and seller of whisky and other beverages). 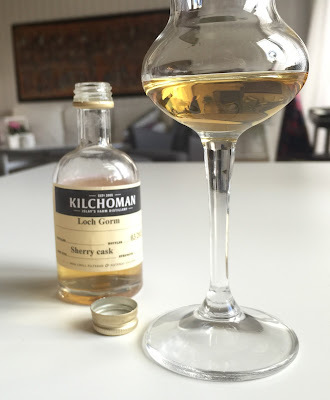 The package contained a bunch of Kilchomans and now the time has finally come for me to try another one of the, namely the third batch of Kilchoman Loch Gorm that has been matured solely in sherry casks! Swedes will find it here. Ok, let’s see what we have here! Unfortunately I can’t really say that I pick up any specific or very evident notes of sherry cask… However, I do pick up something strongly reminding me of oranges or orange peel (maybe qumquats?) in combo with burnt sugar (maybe that’s the sherry influence in this whisky…). There’s also a fair amount of smooth vanilla. Beneath this top layer it’s of course impossible not to notice the very big peat, which has bold notes of burnt grass, pear and a very citric overnote in it. Nice, a really bold peat! To sum up, please feel free to compare this tasting note with my tasting note of last years batch of the Loch Gorm. 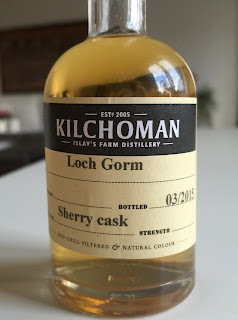 To me it's very interesting to see that I basically or in general picked up kind of the same things back then… I find it hard to believe that the sherry casks used for Loch Gorm are first fill, not that anyone has claimed that of course, but if I was the master distiller of Kilchoman I would definitely take this expression a bit longer and put the new-make into some really active and first fill sherry casks and let the fans of Kilchoman really experience that profile! 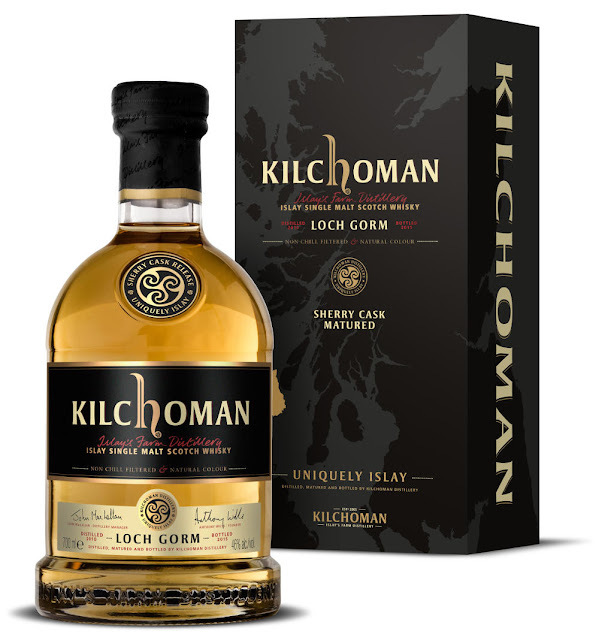 Anyways, this expression of Kilchoman is of course nice in its own way, a very unique style and a very unique distillery for sure, but that is what I would like to experience! Now, according to the website the 18yo has been matured in a combination of Spanish ex-sherry casks as well as in American bourbon barrels. However, from the inside-material I have been provided with (big thanks Tommy) we get some more precise info stating the following: "Matured initially in first and second fill American oak, ex-bourbon casks, with a period of further maturation in first fill Spanish oak, ex sherry butts". Nose: Mmm, really nice! 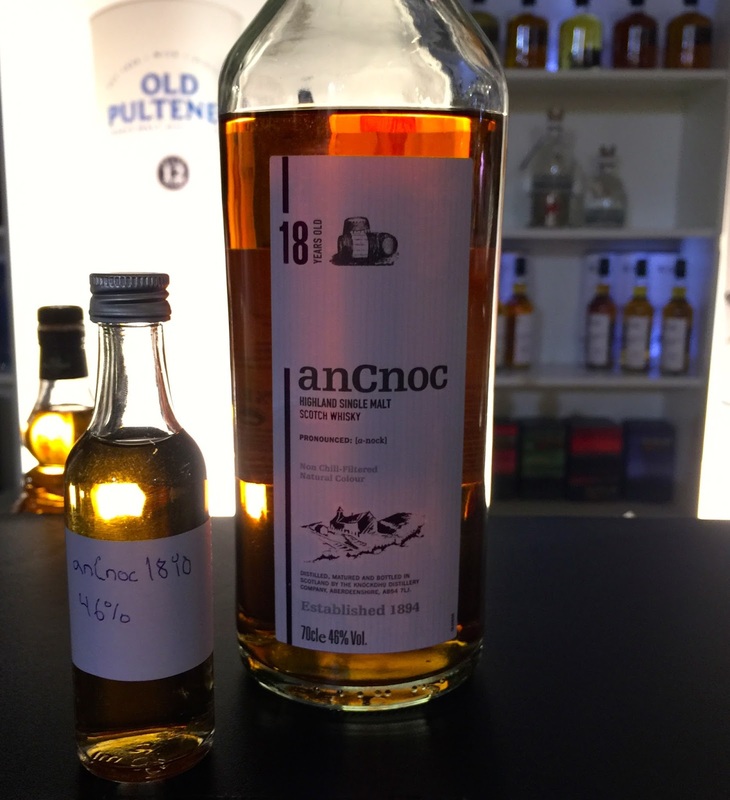 So soft but still fat… Compared to the other anCnoc standard editions (the 12yo and the 16yo which I would think of as primarily bourbon-ish) this one has a lot of sherry influence on the nose! The sherry-style is in fact the first thing I pick up so that’s nice! Quite powerful sherry influence that is, and also being quite thick and bold for being an anCnoc. This particular part of the nose also has a quite rich "citric" charachter to it. Besides this I also pick up a mix of dried peaches, dried figs and something like canned pears, maybe even the juice itself… maybe even a bit of pinneaple? Cool! below this layer of stuff we also have a quite fat vanilla vibe going on and on and on that’s sort of carrying all of the other stuff in it’s hand. I really could nose this forever… BUT! At the same time I really want to have a taste! Palate: Oh yes! 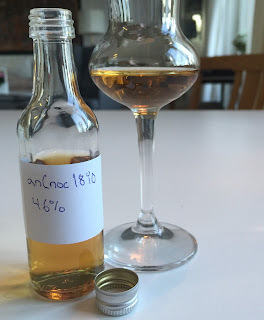 This 18 year old really has an emphasis on sherry! Absolutetly beautiful palate! Together with this very ”warm” and confident mouthfeel of bold sherry-influence I pick up what I would refer to as slowly running quite dark honey… mmm… we also have a big hand of vanilla but not the fudge-ey kind, rather high-class vanilla powder in style (not dry of course)… also, we have smooooth almond paste, and dried sticky/chewy dates, but I can’t really pick up any of the fruits from the nose. All this is warming my chest in a wonderful way. 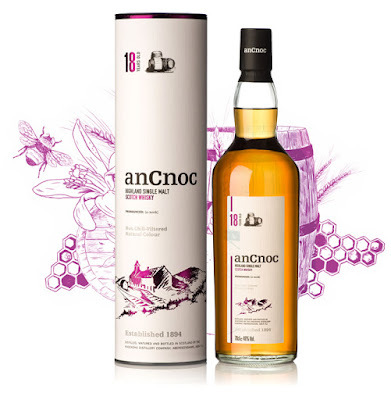 Folks, together with the 35yo this is definitely the best (unpeated) anCnoc I’ve tasted so far, and I’m really not used to an anCnoc being this sherry-influenced, great stuff let me tell you, if I had a bottle of this one at home, I would definitely enjoy a wee dram of it every day! A big thanks to the nice people at Berntson, especially to Tommy for providing me with the opportunity to try this beauty! Please follow SamuelWhisky on my Zuckerberg-page by going here, and on my bird-page by going here. Copyright © and All Rights Reserved on all tasting notes by SamuelWhisky and pictures likewise belong to SamuelWhisky unless stated. If you would like to use any such material that belongs to SamuelWhisky or associated with SamuelWhisky, please ask by sending me an email to samuelkarlssonorebro@gmail.com Sláinte! 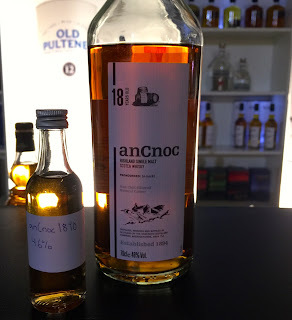 p.s I've heard there is a 24yo anCnoc coming soon and I think it is supposed to be exclusive for Sweden! it will be released at systembolaget as soon as the stock of the 22yo is out! 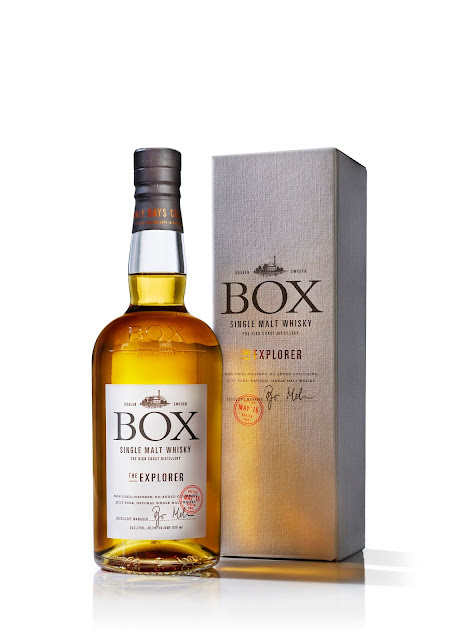 Swedish whisky from Box – The Explorer 48,3% ABV! Friends and followers! 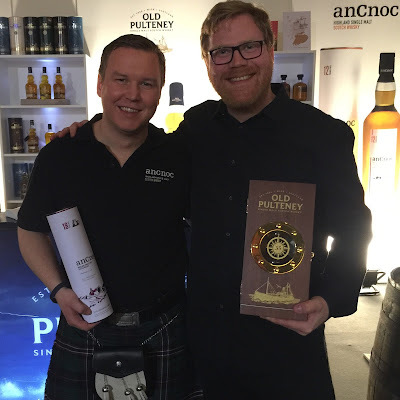 As you might remember, I very recently visited the Swedish distillery Box together with a small bunch of bloggers and colleagues alike, if you have not read that story yet, please check it out here. One of the reasons we were invited was to have an exclusive taste of their upcoming release The Explorer which will be released this friday, at least here in Sweden, so do check out the link to the release by clicking here! The Explorer is the third release in their series called the Early Days Collection. As you might know by now the people at Box Distillery are (and always will be) very, very, very open with their recipies and production process because they really want us to know what we are drinking, and how it was produced. This is of course the case also with The Explorer. "The Explorer is mainly matured in bourbon casks, three different sizes, 40 litre, 100 litre, and traditional quarter casks at 130 litres. The ages vary from 3 years and 3 months, to roughly above 4 years. 61 percent of the whisky is peated, which gives The Explorer a quite smoky character. Much of the taste also comes from new oak. Ten percent of the casks are so called Fresh Oak, which contributes with lots of powerful tastes. The kinds of new oak used are three; swedish oak, hungarian oak and american oak. The casks have been charred from three given specifications; moving from medium charring up to heavily charring. The charring is of great significance for the features of the whisky and a very important part of the work behind the Early Days Collection"
Ok, sounds great, let's have a taste shall we?! Gentle peat, soft smoke in mix with a very present but still restrained vanilla, sounds strange but it’s a bit hard to explain… to say that the vanilla definitely is there but not in the absolute foreground might be better… there is also some sugar-y-ish fudge, a bit of ”burned out campfire” (yay, my first time picking up campfire in a whisky!). I also pick up a touch of christmas tree, something citric but not very pronounced, the sweetness from overripe red apples… Veeery soft and quite fruity actually! Also, when it comes to the peat-profile/style of the peating itself, I kind of get a feeling of Connemara, yes! quite similar… (and you all know that I looove Connemara). One thing that is very obvious, compared to the previous releases is that on the nose there is no sign of, or anything at all reminding me of raw-spirit/new-make in this release. There was a wee bit of that in the previous releases, but non in this one. A very good sign. Let’s have a taste! The peat is the thing that hits the tounge first. More peat on the palate than I figured there would be judging from the nose! Very delicate mix of soft vanilla somewhere in the background of everything, but the most pronounced stuff on the palate, after the peat, is a variety of different fruits, sort of like overripe banana, peach (both the actual fruit and peach-candy), honey-melon, apple, a touch of new oak, and quite fire-y-ish wood so to speak… When holding the whisky in my mouth for a couple of seconds or three, really tasting it, almost ”chewing” the whisky, I find that first comes the peat, then the touches of/the feeling of new oak acts as a bridge that slowly moves on into the fruity stuff. An absolute seamless developement of tastes on the palate, I’m not kidding folks, this is very good stuff… such a great composition when it comes to the total balance and how the flavours develop and interact! And, as I observed on the nose with no ”new-make vibes”, it’s absolutely the same on the palate. Of course one feels that it is quite a young whisky, but this is very, very good for being this age, very smooth, this is definitely their best so far! Finally, a big thanks to the nice people at Box Distillery for providing me with the opportunity to try The Explorer!